Stamina Meter is a free Windows 8 Stamina Calculator app that lets you calculate your stamina in easy steps. If you want to know how much stamina you have, this app is an instant calculator for the purpose. 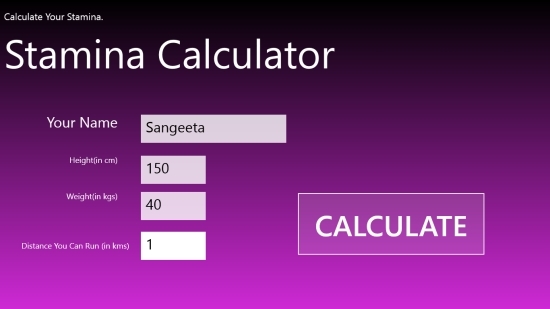 This free Windows 8 Stamina Calculator app requires just a few simple input parameters such as your weight, height, and distance you can run in kilometres, to calculate your stamina. The stamina is calculated in percentage in fraction of seconds. As claimed by the app, it uses the most accurate formula for calculating stamina. Stamina Meter is freely available in Health & Fitness category of Windows Store. You can search for the app in Windows Store using Win+Q key combination or view it directly in Windows Store by clicking on the link given at the end. Let’s see how you can use this free Windows 8 Stamina Calculator app. Stamina Meter is a single screen, very lightweight, and simple application. To use this app, just install it on your Windows PC. As you launch the app, you will see the main screen of the app. Fill in your Name, Height, Weight, and Distance you can run in kilometres in the directed fields and tap on Calculate button. Your stamina will be displayed right above Calculate button. Also check some other free Windows 8 apps we reviewed earlier: CaloriesCalculator, Yoga. Stamina Meter is a simple Windows 8 app to calculate your stamina. But it doesn’t carry any other complementary information to make it more comprehensive. You can still give it a try. Share your feedback via comments.